Thomas Briese, Ralf Dürrwald, Masayuki Horie, Timothy H. Hyndman, Norbert Nowotny, Susan L. Payne, Dennis Rubbenstroth, Mark D. Stenglein, Keizō Tomonaga, Jens H. Kuhn: the members of the 2017–2020 International Committee on Taxonomy of Viruses (ICTV) Bornaviridae Study Group; Gaya K. Amarasinghe, Christopher F. Basler, Sina Bavari, Alexander Bukreyev, Kartik Chandran, Ian Crozier, Olga Dolnik, John M. Dye, Pierre B. H. Formenty, Anthony Griffiths, Roger Hewson, Gary P. Kobinger, Eric M. Leroy, Elke Mühlberger, Sergey V. Netesov, Gustavo Palacios, Bernadett Pályi, Janusz T. Pawęska, Sophie J. Smither, Ayato Takada, Jonathan S. Towner, Victoria Wahl, Jens H. Kuhn: the members of the 2017–2020 ICTV Filoviridae Study Group; Piet Maes, Ralf G. Dietzgen, W. Paul Duprex, Dàohóng Jiāng, Bertus K. Rima, Dennis Rubbenstroth, Peter J. Walker, Yong-Zhen Zhang, Jens H. Kuhn: the members of the 2017–2020 ICTV Mononegavirales Study Group; María A. Ayllón, Dàohóng Jiāng, Shin-Yi L. Marzano: the members of the 2017–2020 ICTV Mymonaviridae Study Group; Ralf G. Dietzgen, Dàohóng Jiāng, Nikos Vasilakis, Jens H. Kuhn: the members of the 2017–2020 ICTV Nyamiviridae Study Group; Anne Balkema-Buschmann, William G. Dundon, W. Paul Duprex, Andrew J. Easton, Ron A. M. Fouchier, Gael Kurath, Robert A. Lamb, Benhur Lee, Bertus K. Rima, Paul Rota, Lin-Fa Wang: the members of the 2017–2020 ICTV Paramyxoviridae Study Group; Paul A. Brown, Rik L. de Swart, Jan F. Drexler, W. Paul Duprex, Andrew J. Easton, Julia L. Hurwitz, Jiànróng Lǐ, Kirsten Spann, Bernadette van den Hoogen, John V. Williams: the members of the 2017–2020 ICTV Pneumoviridae Study Group; Kim R. Blasdell, Ursula J. Buchholz, Ralf G. Dietzgen, Anthony R. Fooks, Juliana Freitas-Astúa, Hideki Kondō, Gael Kurath, Ivan V. Kuzmin, David M. Stone, Robert B. Tesh, Noël Tordo, Nikos Vasilakis, Peter J. Walker, Anna E. Whitfield: the members of the 2017–2020 ICTV Rhabdoviridae Study Group; Peter Simmonds: the 2017–2020 ICTV Chair of the Fungal and Protist Viruses Subcommittee; Peter J. Walker: the 2018–2020 ICTV Proposal Secretary; F. Murilo Zerbini: the 2017–2020 ICTV Chair of the Plant Viruses Subcommittee; and Jens H. Kuhn: the 2017–2020 ICTV Chair of the Animal dsRNA and ssRNA-Viruses Subcommittee. The virus order Mononegavirales was established in 1991 to accommodate related viruses with nonsegmented, linear, single-stranded, negative-sense RNA genomes classified into three families [12, 13]. According to the previous ratification vote held in March, 2018, the order included eight families . Amended/emended order descriptions were published in 1995 , 1997 , 2000 , 2005 , 2011 , 2016 , 2017 , and March 2018 . Here, we present the changes that were proposed via an official ICTV taxonomic proposal (TaxoProp 2017.016M.A.v1.Mononegavirales_rev) at http://www.ictvonline.org/ in 2017 and were accepted by the ICTV Executive Committee (EC) in October 2018. These changes are now part of the official ICTV taxonomy as of October 2018. In October 2018, the order Mononegavirales was expanded by three families. The family Artoviridae was created for the established genus Peropuvirus (moved out of Nyamiviridae) and six new species for Běihǎi barnacle virus 8 (BhBV-8), Běihǎi rhabdo-like virus 1 (BhRLV-1), Běihǎi rhabdo-like virus 2 (BhRLV-2), Húběi rhabdo-like virus 5 (HbRLV-5), Húběi rhabdo-like virus 6 (HbRLV-6), and Húběi rhabdo-like virus 8 (HbRLV-8), all discovered in invertebrates [8, 17]. 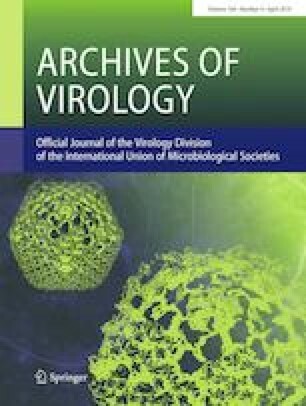 The family Lispiviridae was established for inclusion of the floating genus Arlivirus; the novel species Hubei arlivirus, Odonate arlivirus, and Wuchang arlivirus for Húběi rhabdo-like virus 3 (HbRLV-3), Húběi odonate virus 10 (HbOV-10), and Wǔchāng romanomermis nematode virus 2 (WcRNV-2) discovered in invertebrates; and the (renamed) species of the now abandoned free-floating genera Chengtivirus and Wastrivirus [8, 17]. The family Xinmoviridae was established for the floating genus Anphevirus, and six novel species were added to the genus for Bolahun virus (BLHV), Drosophila unispina virus 1 (DuniV-1), Húběi diptera virus 11 (HbDV-11), Húběi orthoptera virus 5 (HbOV-5), Húběi rhabdo-like virus 7 (HbRLV-7), and Shuāngào fly virus 2 (SgFV-2) discovered in invertebrates [6, 8, 9, 17]. In October 2018, no changes were made at the family rank. In October 2018, six new species were added to the genus Sclerotimonavirus for Húběi rhabdo-like virus 4 (HbRLV-4), Sclerotinia sclerotiorum negative-stranded RNA virus 4 (SsNSRV-4), soybean leaf-associated negative-stranded RNA virus 1 (SLaNSRV-1), soybean leaf-associated negative-stranded RNA virus 2 (SLaNSRV-2), soybean leaf-associated negative-stranded RNA virus 3 (SLaNSRV-3), and soybean leaf-associated negative-stranded RNA virus 4 (SLaNSRV-4) associated with soybean leaves, invertebrates, and fungi [10, 11, 17]. In October 2018, the free-floating genus Crustavirus was included in the family, and two novel species were added to that genus for Běihǎi rhabdo-like virus 6 (BhRLV-6) and Wēnlǐng crustacean virus 12 (WlCV-12) discovered in invertebrates. One genus, Peropuvirus, was moved from the family into the new family Artoviridae. Finally, the family was expanded by three novel genera that include a total of five new species for Běihǎi rhabdo-like virus 3 (BhRLV-3), Běihǎi rhabdo-like virus 4 (BhRLV-4), Běihǎi rhabdo-like virus 5 (BhRLV-5), Orinoco virus (ONCV), and Wēnzhōu tapeworm virus 1 (WzTWV-1) discovered in invertebrates [8, 17]. This work was supported in part through Battelle Memorial Institute’s prime contract with the US National Institute of Allergy and Infectious Diseases (NIAID) under Contract no. HHSN272200700016I (J.H.K.). This project has been funded in whole or in part with federal funds from the National Cancer Institute, National Institutes of Health, under Contract No. HHSN261200800001E (I.C.). This work was also funded in part under Contract No. HSHQDC-15-C-00064 awarded by DHS S&T for the management and operation of the National Biodefense Analysis and Countermeasures Center (NBACC), a federally funded research and development center (V.W. ); and National Institutes of Health (NIH) contract HHSN272201000040I/HHSN27200004/D04 and Grant R24AI120942 (N.V., R.B.T.). This work was also supported by the UK Department for Environment, Food and Rural Affairs (Defra), Scottish Government and Welsh Government (Grant number SV3500) (A.R.F.). The views and conclusions contained in this document are those of the authors and should not be interpreted as necessarily representing the official policies, either expressed or implied, of the US Department of the Army, the US Department of Defense, the US Department of Health and Human Services, the Department of Homeland Security (DHS) Science and Technology Directorate (S&T), or of the institutions and companies affiliated with the authors. In no event shall any of these entities have any responsibility or liability for any use, misuse, inability to use, or reliance upon the information contained herein. The US departments do not endorse any products or commercial services mentioned in this publication.